In industrial bread bakeries, processes such as the dough preparation, baking, cutting and packaging of bread products are all automated. There is a demand within this industry however for a rapid and flexible solution to the automation of the dough making process. Operators need to be able to request recipes both locally and from a central location. Thanks to our ample experience in relation to batch processing and ISA-S88, Moekotte is the right party to choose if you require a flexible, automated dough and pastry production system. The automation of this batch method of production (in accordance with ISA-S88) is effected using a SCADA PC in combination with a number of PLCs. Recipes are stored under a recipe number, which enables the operator to input the data for an entire day's production. Moekotte Enschede has provided for the automation of the production process within a number of large bakeries within the Kamps group and in a number of cases, has even provided an autopilot function, which is controlled from the central control room. 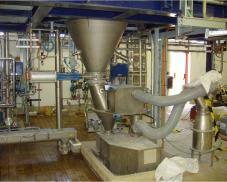 This enables the dough or pastry to be manufactured to order, without the intervention of the operator. By applying basic software and standard components, Moekotte has succeeded in placing a concept on the market that can be used for all manner of automated weighing and dosage measuring processes.